Our philosophy is to craft gelato that is rich, genuine and natural following the most rigorous artisanal standards and above all, prepared with the best raw ingredients available. Our gelato is freshly whipped daily in our on-site kitchen. Our gelato is prepared with fresh, high quality milk and cream from selected stalls in the Roman countryside, produced in limited quantities according to strict qualitative standards. We do all this in order to offer you a unique and distinguished product that represents high-quality ingredients, originality and traditional preparation. In the historical tradition for artisinal gelato, the pozzetto style counter (deep, covered wells) remains the best way to conserve high quality gelato before it is enjoyed; for this we choose to keep the gelato covered, because in our opinion gelato should be tasted before admired. It isn’t so much the aesthetic of our gelato that we offer but rather the highest quality in flavor and ingredients. 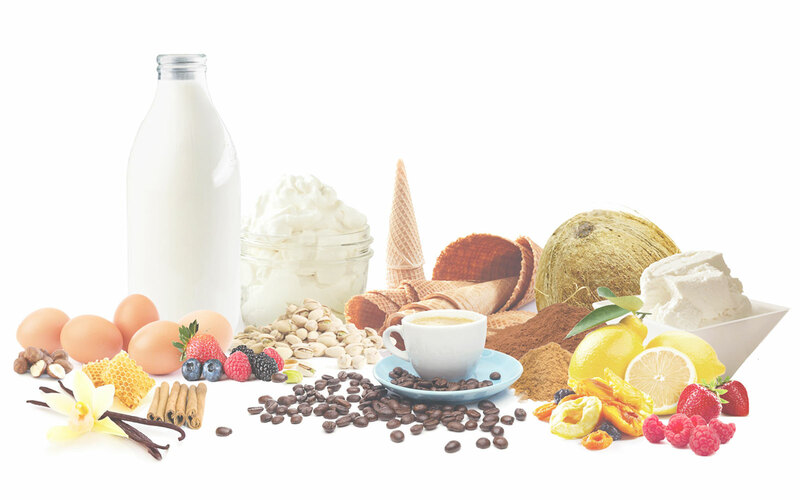 Learn more about our high quality ingredients! Hover over each circle to learn more about each ingredient. • Natural vanilla beans from Tahiti with warm, delicate, and slightly fruity notes. • Honey from lavender nectar (with limited production) from strictly producers in the Roman countryside. • Cinnamon from Madagascar with its distinctive taste and aroma that’s sweet and delicate. Our hazelnut gelato is made with 100% Nocciola Tonda Gentile Romana cultivated in the Cimini and Sabatini hills in the Province of Viterbo, without any artificial colorings or flavorings. Our eggs are sourced exclusively from free-range Italian producers. Our crema daRe uses 18% egg yolk to give it its distinctive intense, authentic flavor like the cream gelato our grandmothers used to make. Our sorbets are prepared exclusively with 60/70% nationally sourced fresh fruit and sugar, without milk and flavorings, giving our sorbets full, intense fruit flavor. Our pistachios are 100% natural and matured in the warmth of the California sun, cultivated according to the strictest standards and traditional slow methods to ensure the characteristic flavor of the nut is purely represented. We use a selective mix of 100% caffe arabica coffee beans for our coffee gelato which is sourced from Central and South America, adding strong and fruity notes. Our chocolate gelato flavors are made with raw CRU cacao from cacao “ARRIBA” in Equador and precious aromatic cacao, cultivated in Central America. Our chocolate flavors are strongly aromatic as a result of the high quality raw cacao, giving our gelato intense and profound chocolate decadence. Our dried fruit is made from fresh fruit carefully sourced from local markets and brought to our kitchen where we caramelize it in its own natural sugars. We use exclusively fresh Ricotta Romana DOP that is produced from full sheep’s milk raised on the vast natural pastures in the Lazio Region. The sweet flavor is a distinguishable characteristic of Roman ricotta.